President Trump has called the op-ed "gutless." One of President Donald Trump's top aides, Kelleyanne Conway, on Friday became the latest high-ranking administration official to deny authoring that anonymous New York Times op-ed blasting her boss. Conway, whose title is Counselor to the President, called on anyone working to frustrate the president's agenda from inside the White House to resign. "I did not write the op-ed," she told reporters. “The people who believe in the president’s agenda and believe in the president’s leadership ought to do their jobs, and if they don’t want to do that ... they should just resign," she said. On Thursday, many members of President Donald Trump's Cabinet and other top advisers also took the extraordinary step of issuing public denials that they authored the bombshell New York Times op-ed attributed to an anonymous senior official in the administration. 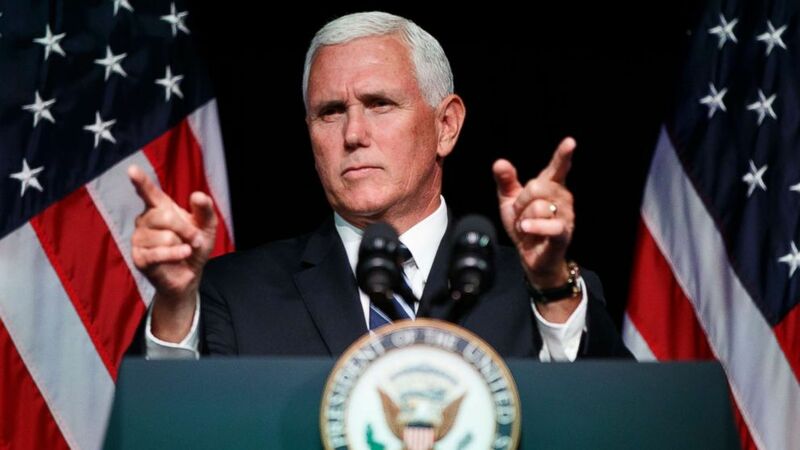 (Evan Vucci/AP) Vice President Mike Pence gestures during an event on the creation of a U.S. Space Force, Aug. 9, 2018, at the Pentagon. Defense Secretary James Mattis, who is traveling in India, also issued a firm denial through chief Pentagon spokesperson Dana White, who said plainly: "It was not his op-ed." Secretary of State Mike Pompeo, also overseas, asked whether he was the author, blasted the New York Times for publishing what he said was "a disgruntled deceptive bad actor's word," and calling on the author, "if it's accurate" that they are a senior administration official, to take their "singular option, that is to leave." Then, he quickly said, “I know someone will say: 'Gosh he didn’t answer the question,' adding, "It’s not mine." The head spokesman at the Treasury Department also issued a firm denial, calling the prospect laughable that Secretary Steve Mnuchin would have been behind the essay. A denial from Department of Homeland Security Secretary Kirstjen Nielsen came through press secretary Tyler Houlton. “Secretary Nielsen is focused on leading the men and women of DHS and protecting the homeland - not writing anonymous and false opinion pieces for the New York Times. These types of political attacks are beneath the Secretary and the Department’s mission," Houlton said. Secretary of the Interior Ryan Zinke is traveling, but a spokesperson gave a straightforward denial on his behalf: "He absolutely did not write this garbage," Department of the Interior press secretary Heather Swift said to ABC News in an email. U.S. Ambassador to the U.N. Nikki Haley did not write the op-ed, a spokesperson for the U.S. Mission to the United Nations wrote over email. Liz Hill, a spokesperson for the Department of Education, denied that Secretary Betsy DeVos was the author, saying a tweet that DeVos "is not a Washington insider and does not play Washington insider games." A Department of Justice official issued a denial on Jeff Sessions' behalf, saying the attorney general did not write the essay. "The media's wild obsession with the identity of the anonymous coward is recklessly tarnishing the reputation of thousands of great Americans who proudly serve our country and work for President Trump. Stop. If you want to know who the gutless loser is, call the opinion desk of the failing NYT ...," Sanders said. "They are the only ones complicit in this deceitful act. We stand united together and fully support our President Donald J. Trump." White House Counsel Don McGahn, on Capitol Hill for the third day of Supreme Court nominee Brett Kavanaugh's confirmation hearings, issued a straightforward denial to reporters on the Hill who asked him about the op-ed: "No," he said. Secretary of Energy Rick Perry tweeted his denial and called the author a "coward, unworthy of serving this nation." Secretary of Commerce Wilbur Ross tweeted a denial as well. "I couldn't be prouder of our work at Commerce and of @POTUS," Ross wrote. Spokesperson Caitlin Oakley at the Department of Health and Human Services said on behalf of Secretary Alex Azar: "No, the secretary did not write the op-ed," she said. When asked if CIA director Gina Haspel wrote it, CIA press secretary Timothy Barrett said, "No." A spokesperson for Secretary of Veterans Affairs Robert Wilkie added him denial to the list, saying neither Wilkie "nor anyone at VA" wrote the op-ed. "Under President Trump, VA has accomplished more in the last 18 months than it has in decades in reforming the department and improving care and benefits for our nation’s heroes," spokesperson Curtis Cashour told ABC News. "We are committed to continuing this progress under the president’s leadership." A Department of Labor spokesperson issued a denial on behalf of Secretary of Labor Alexander Acosta, calling the op-ed "sophomoric Washington games." "He is definitively not the author," the spokesperson said. The press office at the Department of Agriculture said Secretary Sonny Perdue "did not write the op-ed" and pointed to the statement from Sanders. A spokesperson for the EPA, John Konkus, also pointed to Sanders' tweet in denying that Acting Administrator Andrew Wheeler authored the op-ed and called for the writer to resign. "Acting Administrator Wheeler supports President Trump 100 percent and is honored to serve in his cabinet, he also believes whoever wrote the op-ed should resign," Konkus said in an email. The U.S. Ambassador to Russia, Jon Huntsman Jr., rejected speculation about him, issuing his denial through his spokesperson at the U.S. Embassy in Moscow. "Amb Huntsman: Come to find, when you’re serving as the U.S. envoy in Moscow, you’re an easy target on all sides. Anything sent out by me would have carried my name. An early political lesson I learned: never send an anonymous op-ed," Andrea Kalan tweeted on behalf of Huntsman. 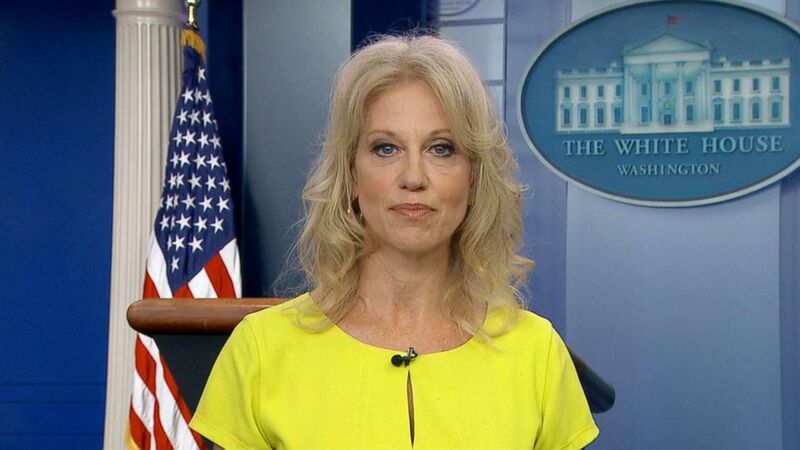 Top aide Kellyanne Conway denied authoring the op-ed Friday and called on anyone working to frustrate the president's agenda from inside the White House to resign. "I did not write the op-ed," she told reporters.“The people who believe in the president’s agenda and believe in the president’s leadership ought to do their jobs, and if they don’t want to do that ... they should just resign," she said. Director of the National Economic Council Larry Kudlow also distanced himself from the essay, telling reporters, "Of course I didn't do it." In the essay, first published online by the New York Times on Wednesday afternoon, the unnamed official painted a grim picture of a presidency in crisis, with senior members of the president's team actively working to undermine the president when officials believe his desired actions pose a risk to the nation's national security and basic governing principles. “I work for the president but like-minded colleagues and I have vowed to thwart parts of his agenda and his worst inclinations,” the anonymous individual writes. “… We believe our first duty is to this country, and the president continues to act in a manner that is detrimental to the health of our republic," the writer continued. "It may be cold comfort in this chaotic era, but Americans should know that there are adults in the room. We fully recognize what is happening. And we are trying to do what’s right even when Donald Trump won’t." Speculation abounds within the administration about who may have authored the brazen op-ed, with the White House launching a fact-finding mission to try and track down the individual now being viewed as a traitor internally. White House press secretary Sarah Sanders issued a strongly worded statement Wednesday calling for the individual to resign. She called for the Times to apologize as well. President Trump has labeled the op-ed writer "gutless," called for the New York Times to turn the individual over to the government, and raised the question, in a one-word tweet, whether the essay amounted to treason. ABC News' Cheyenne Haslett, Erica King and Ben Gittleson contributed reporting.